Time Circle's smart algorithm detects the price circles with time . give strong signals at the right time as result of combine the price and time. our team spent months to develop this indicator specially for GBPJPY ..with high success rates about 82% win trades over two years .tested from December 2016 to November 2018. *** in last two years total signals 1012 with 829 Wins and 183 Loss. Easy, visual and effective Signals. Gives you the ability to filter and further improve your trading strategies. Signals strictly on the "Close of the bar". Works best on GBPJPY on frame 1H. Enter the signal after the candle close (Statistics Success Rate > 82%). Exit buy signal on close the candle below the stoploss line(look at photos below). 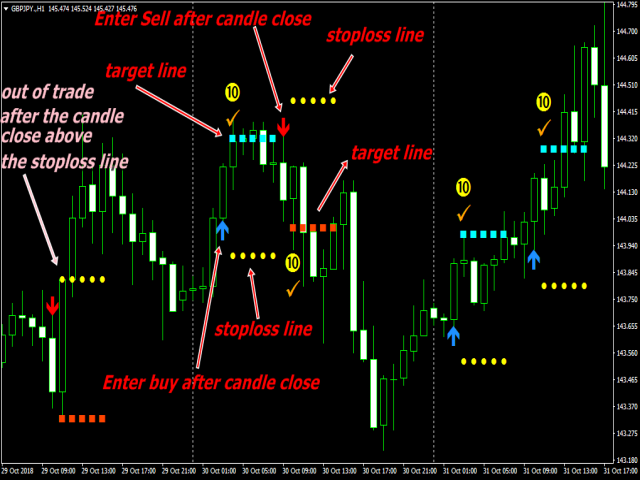 Exit sell signal on on close the candle above the stoploss line(look at photos below). Take profit on target line (look at photos below). studying time circles for different currency pairs and working hard to launch more indicators for other currencies with success rate more than 80%..